If so, you may quickly find yourself asking “what is the difference between hydroponics, aquaponics, and aeroponics?” In this article, we’re going to explain the meaning of each and make some helpful comparisons. Let’s break it down nice and easy! Hydroponics literally means ‘water working’ and is the soil-less growing of plants. In hydroponics, plants grow their roots in a soil alternative (called a growing medium) such as rockwool or hydroton. Then, a nutrient solution (in liquid form) is added to the water which is used for watering the plants. Various nutrient formulas have been designed specifically for hydroponics and have the proper ratios of nitrogen, phosphorous, and potassium (N-P-K) along with other trace elements plants need to encourage optimal plant growth. This solution is added to the water so that when plants receive that h2o, they also soak up the other nutrients they need. Aeroponics means ‘air working’ and is similar to hydroponics in that it is also a soil-less method in which nutrients are delivered through water. However, with this method the plants grow in an air or mist environment. The main difference here is that the water and nutrients are delivered differently than they are in hydroponics. Aquaponics is different than both hydroponics and aeroponics in that it’s achieved through a combination of aquaculture (raising fish) and hydroponics (the soil-less growing of plants). Adding fish into the equation creates a natural ecosystem in which fish, plants, and bacteria thrive off one another. Instead of needing a nutrient solution mixed with chemicals, the waste from fish and the living bacteria in an aquaponics system provide all of the nutrients the plants need. Likewise, the fish together with the bacteria create a cleaner, non-toxic environment for the fish to live in. Hydroponics and aeroponics have an advantage in that they are a bit quicker to start. In some cases setting up these systems can also be more simple. When fish are left out of the equation, there are less variables to measure and monitor for water quality. Fish can die off quickly in an aquaponics system if the water quality (temp, oxygen, nitrogen levels) isn’t just right for them. This could be a good reason to start with hydroponics if you’re new to all of these growing techniques. (We recommend starting with a hydroponics kit if it’s your first time so you have everything you need to get started, this link will take you to one made by Agrowponics). 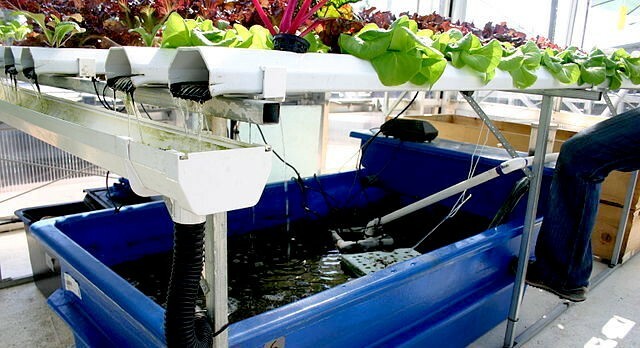 One more advantage for hydroponics is that an aquaponics system has to be cultivated in the beginning and it takes at least a month or so to introduce fish into the water. This process involves letting a bacteria colony build in the system that can regulate the water and covert fish waste to keep it from being too toxic for the fish. Now onto some key advantages of aquaponics! Besides growing and harvesting fish for protein, one of the biggest advantages of aquaponics over other methods is that it is a necessarily natural and organic process. Hydroponics requires growing in a man-made environment and adding man-made nutrient solutions, whereas in aquaponics you are creating a natural ecosystem relying on bacteria to convert fish waste into a complete plant food. It’s also worth noting that if herbicides or pesticides are applied to the plants, the fish will be harmed. This also holds true the other way around so that if growth hormones or antibiotics or anything else unnatural is given to the fish, the plants will suffer. Because of the way this natural process works, aquaponics is scientifically proven to achieve better growth, lower disease rates, and less system maintenance. Why Do These Farming Methods Matter? The beautiful thing about all of these methods is that open up possibilities for growing healthy, high quality produce in a way that’s both fun and efficient! Because these methods do not use soil, they can be set up and used indoors in places that have cold, harsh climates like Alaska. These water working methods can also be used in places that have poor, sandy soil like areas in southern Florida. In urban areas, vertical farming techniques using equipment like the grow towers we make save space and make growing large quantities of crops possible on rooftops and small abandoned lots.